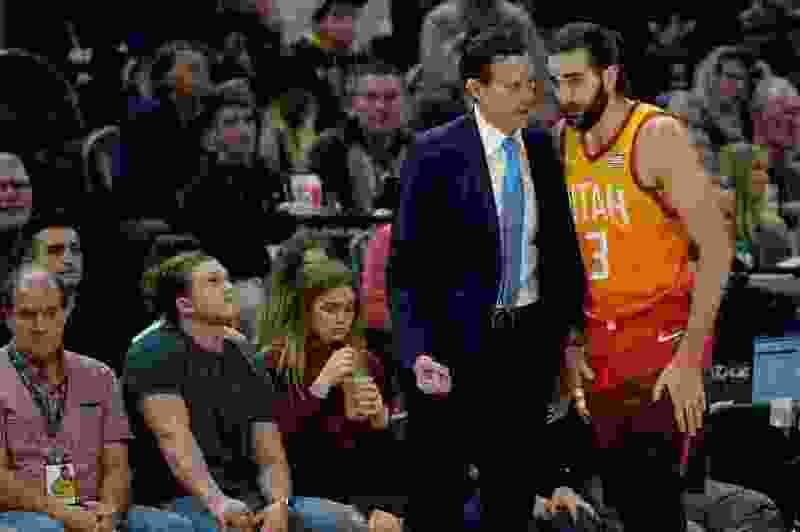 (Francisco Kjolseth | The Salt Lake Tribune) Utah Jazz head coach Quin Snyder talks with Utah Jazz guard Ricky Rubio (3) during their game agains the Thunder in the second half of the NBA game at Vivint Smart Home Arena Sat., Dec. 22, 2018, in Salt Lake City. As the Jazz’s front office met on the second floor of the Zions Bank Basketball Campus to decide which direction they were going to take their team through the final hours before the trade deadline, Ricky Rubio was sitting one floor down, eating lunch with teammates Joe Ingles and Kyle Korver. Oh, and he was sending out tweets, too, getting through one of the most nervy moments of his career with humor. “Joe Ingles had two coffees this a.m. league source tell Ricky”, said one tweet. Another joked that if he turned his phone on airplane mode, he wouldn’t be able to accept news of the trade. That doesn’t mean Rubio was having fun in the final hours, though. And after the 1 p.m. deadline passed, and he knew he was staying in Utah, Rubio sent out a celebratory gif from his favorite TV show, Friends. He also received words of congratulations from his teammates and friends. Whether Rubio was unhappy with the Jazz’s front office in particular, or speaking generally about NBA management overall was unclear, but Jazz pubic relations staff quickly interrupted and asked for questions on topics other than the deadline. Derrick Favors was more sanguine about the deadline coming and going. But he did acknowledge that not everyone was as calm, or as experienced, on deadline day. And Quin Snyder, as always, stayed focused on the future rather than the past. Tipoff • Saturday, 3 p.m.
About the Jazz • Reserve forward Thabo Sefolosha, who has been out since Jan. 5 with a right hamstring strain, was a participant in Friday’s practice. … Utah is coming off a 116-88 victory over the Phoenix Suns on Wednesday. … Rudy Gobert had a team-high seven assists in the last matchup with the Spurs. About the Spurs • DeMar DeRozan led San Antonio with 26 points and eight assists in the teams’ previous meeting. … Forward LaMarcus Aldridge was picked to play on Team LeBron at the All-Star Game. … San Antonio has dropped three straight games, and is just 10-18 on the road this season.